Red Mountain is a large volcano found at the center of Vvardenfell. 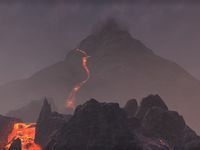 It is the largest volcano in Tamriel, and is the source of many Foyadas that flow lava all across the island. It is also considered its own region, bordering the Ascadian Isles, Ashlands, Grazelands, Molag Amur, and West Gash. The mountain is not intended to be climbed, making it and many of the locations in its regional borders normally inaccessible. During the quest Divine Disaster, the volcano will begin to tremble and near eruption, resulting in more ash and lava outflows come out from its peak. It will return to its regular state after Vivec's power has been restored in Divine Restoration. Divine Disaster: Recover a Blessing Stone in order to prevent a cosmic catastrophe. This location has appeared many previous games, including Arena, Morrowind, and Dragonborn. Prior to the release of ESO: Morrowind, it could also be seen in the distance from the Stonefalls. This page was last modified on 19 November 2018, at 07:27.